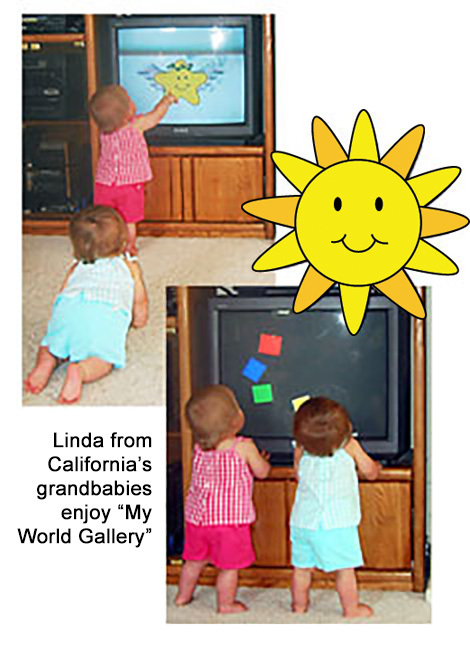 Nothing makes our day like viewer letters, feedback and even pictures of some of our littlest art fans. Here are some of our favorite letters. I am writing to let you know how pleased we are with your videos! I purchased the DVD for my newest grandson. Michael is now 16 months old and carries the empty DVD case around all the time. The case is empty because the DVD is always in the player ready for Michael to view. Thank you for producing such a quality product. I have decided to give your DVDs as baby gifts from this moment forward. You did something very special when you made these 2 DVDs. You made a special little boy (and his family) very happy. God Bless! I wanted to quickly let you know that this DVD is fascinating. I popped it into the DVD player just to see what it was about and found myself a few minutes later watching it and entranced by the music and visuals. My boy has not been born yet, only a few weeks away, but I cannot wait to play this for him and see him as excited and awed as I was by this. I hope to see more products from you in the future and will continue to check up with the site. Thanks again for this invaluable and incredible product. Hi. I just wanted to let you know that I've watched the video and think it is wonderful. My daughter goes crazy for "Star". I think you have a great product that will delight babies as much as the Baby Einstein videos, if not more. I love how you've combined the beauty of so many numerous artworks with interesting and vivid animation. This video is sure to become a favorite of babies everywhere, as I know it will be in my house. I wanted to write to you personally to tell you how much we LOVE this video!! My one and 5 year olds just watched it for the first time and we were all mesmerized. I bought it on VHS to watch on a small TV we travel with, but I plan on ordering it on DVD so we can stop the video on my kids' particular favorite paintings. We have a couple of videos from the Baby Einstein series--I was actually ordering some more online when I came across reviews for yours, and they were so good that I ordered your video based solely on the reviews (I think I saw them on Amazon.com)!! I will definitely tell my friends about this and it will become one of my standard baby and young birthday gifts. Best of luck to you with this wonderful video--are there more in the series yet? I had to get more to give to everyone I know. (Two-year-old) Addicen cannot get enough of this - we watch it at least once a day and she now talks of going to France and Asia and "her" golden gate bridge. She really impressed her grandma telling her Â“I Love YouÂ” in French. Thank you so much for this brilliant product! We really enjoyed this video. I love everything about it, the pictures "painted" in time to the music, the live footage of children and the animation is good too. Your video has been the BEST baby calmer downer EVER -- of ALL the videos. It's amazing how JT stops running around and Jacob stops crying if he's unhappy and the twins stop what they are doing immediately and run to the TV to watch. We are waiting for the next video!!!! Hello. This is my second one from you! We love it! So much better than just having the TV on! This is for a baby shower big sister gift! She loves art at barely the age of 3! Received the dvd today...we love it!!! Katie (14 weeks) is now watching it for the second time because she got upset when I was going to move her to something else. I know it's best to not get them hooked on videos too early, but i do some work from home & need a little help! We borrowed some Baby Einstein from the library and she likes this much better. I have had some previous experience with the Baby Einstein with other friends' children and think this is much more intelligent & entertaining. I recommended it to my expecting friend...and will recommend all around. I wanted to give you feedback on your DVDs. What I liked is the construction of the art and how it progresses from simple shapes to a work of art. It allows for a fluidity in thought/conceptualization. It is not about rote learning and repetition which we can find anyplace. My gripe about Baby Einstein is that it is disjunct. It hints at causality but the close up shots don't allow for the child to follow an image all the way through (things run off the screen and suddenly reappear). Victoria is 6 1/2 months old. She is at the age where she is a sponge I really try to expose her to quality (as opposed to "lets keep her busy and quiet") so I don't use television or videos as a babysitter. However, I am on a quest for quality educational videos as a way for me to be able to take a shower. She thoroughly enjoys your products. Victoria gets very excited when the star character appears (simple and yellow with the right type of voice over). She follows the art images carefully and is totally engaged. When the kids cheer, she whoops along with them. You did a great job - what is next? Top of mind, I'd like to see a video that uses your philosphy to help children's thinking process in identifying animals. The different shapes, figures, etc. that go to forming and differentiating between them. Best of luck to you and I look forward to seeing your next product. Your DVD was received yesterday and has already been played 3 times. It is just wonderful. My 6 month old daughter, Kelsey and I, just returned from a "play group", where I told all the Moms to order one. It is fantastic! Just a note to let you know that the dvd has arrived and it is just great!! I am a nanny and the youngest child is just two. The family has several Baby Einstein videos and we enjoy at least one of them every day but when I saw the Little Laureate's for sale, I thought it would be fun to try something different. The two year old loves it and today when she and I were watching it, the 9 and 10 year olds came in and watched with us. We all got something different and wonderful out of it! Just got the DVD in the mail today. I watched it with my girls (4 and 1.5 years old). They both seemed to really enjoy it. I liked the way that you introduced subtle but significant concepts about art without using many words. We paused the video right after we saw the pointilism (where it starts out with the circles then zooms out to the Seurat) so we could try our own experiments with pointilism (we drew circles on one side of the paper, then used dots to outline them on the other side of the paper.) My oldest daughter started picking out shapes that I missed. I was really surprised how much my 4 year old attached to star. Before we had even watched in through once, she looked forward to the next time she would see star. She even shared with my wife later on how star liked to be the captain of a ship (I think that was what it was). The sections with the children were great too. They were both completely entranced during those sections watching the other children. Altogether I think it is a great concept, and I hope that you are able to continue on with the series. If you have more in this series please let me know, I'd be happy to buy more of the same series. We have received the DVD and watched it several times. We think it's great! My husband and I sat with both of our kids on a Saturday morning and all of us really enjoyed the film. It lays the foundation for an aesthetic sensibility in a child by presenting an introduction to color and shape relationships in art and in the real world as well. Of course, it's a relaxed easy way to enjoy these concepts - the real world occurs only with paint and brush in hand! We got a chance to view the DVD recently and I wanted to let you know that Paige really enjoyed it. She is just 14 weeks old so some of it she was too young to understand but she did seem to enjoy the colors and music and she will grow into the rest. We have 2 baby einstein DVD's that Paige also seems to enjoy but personally I liked your DVD better. It seems to be more educational that just showing toy after toy on the screen and I enjoyed the music also. I will tell all my friends with babies about your DVD and I would be interested in any more DVD's you make. My sister in Arizona recommended this DVD to me, she has been a big fan of the baby einstein series, but in a sort of guilty pleasure way. She doesn't think they are really great as far as development for a child goes, but thinks they seem fairly harmless otherwise. So she discovered this and thought it was wonderful to have some real substance to it. I look forward to seeing for myself how it is. I just wanted to let you know that my daughter likes the DVD so much she watched it 3 times yesterday. My daughter loves your videos! She is only 14 months and was becoming very bored with the Einstein series (we have every single one...they were gifts from my sister). Thank goodness for something new! My 6 month old has watched a couple of times with me. I think he likes it and I know I do! Hello, We are avid fans of Star. My 14 month old twins LOVE LOVE LOVE him. I would love to get them each a Star t-shirt to have for the summer. I keep checking your website, but only the DVD's are offered. Is it possible to purchase one? ©2003 - Little Laureate, L.L.C. All rights reserved.